In (Quick) Summary . . .
Because I mentioned (more than once) that I had this book in my pile to read. . . I just wanted to follow up and say I didn't much care for it on the whole. 1. It's dated. (I hope.) Meissner takes the family in the story to Disney World and the kids in the story are watching SpongeBob on tv. While I don't really mind if Disney World is still around in another 20 years, I'm hoping that fewer people will have a clue who SpongeBob is. The main character also uses her GPS which I recognize is not really a big deal for a story. However, at the same time, when I read along and find references to modern restaurant chains, newly released films, or "hip" cartoon shows, I tend to think that the books which mention those things aren't likely going to stand the test of time. A modern audience might enjoy it for a brief window in time, but the book's lifespan is likely to be short. 2. The book involves a ghost story, of sorts. Again, the subject matter didn't bother me so much until the main character has lunch with a spiritual medium trying to gather information on the supposed ghost. At that point I'd pretty much had enough. It wasn't a spooky-scary story. I just didn't care for how much attention the subject received. I can't even say that Meissner did or did not resolve it well because I didn't complete the read. Basically, this book just did not work well with me and so I didn't read it through in its entirety. I also am not quite comfortable recommending it and so I felt like I should follow up and share my brief thoughts since I mentioned it a time or two. For me, this one is a definite "pass!" I really didn't care for this book either, partly due to the medium aspect. Quickly passed it on. That's too bad. I've liked what I have read of some of her other books (except for what I felt was a serious problem in The Shape of Mercy), but when I read that the house in this book was something of a character, that weirded me out a little, so I wasn't inclined to pick it up..
Let's be more optimistic. Let's hope in less than ten years fewer people will know Spongebob. UGH. Thanks for haring your honest opinion. Happy New year! This was a quite different book, but I did enjoy it. 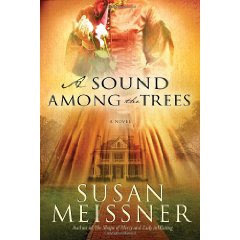 I just knew from reading Susan's other books, that she writes about some different subjects. If you had completely read the book, you would know that she made it clear that there weren't any ghosts. I do understand why this book wouldn't appeal to everyone. Some may not like that a good portion of the book was letters written by the ancestor. However, this is essential to the story. I could relate more to these characters (through the letters) than to the present day characters. I'm so glad I'm not the only person who didn't like this book and didn't finish it. I had pause over the mention of the ghost aspect (even though I knew it didn't exist) but had to set the book aside when I reached the section with the medium. That's a bit too much for my taste.